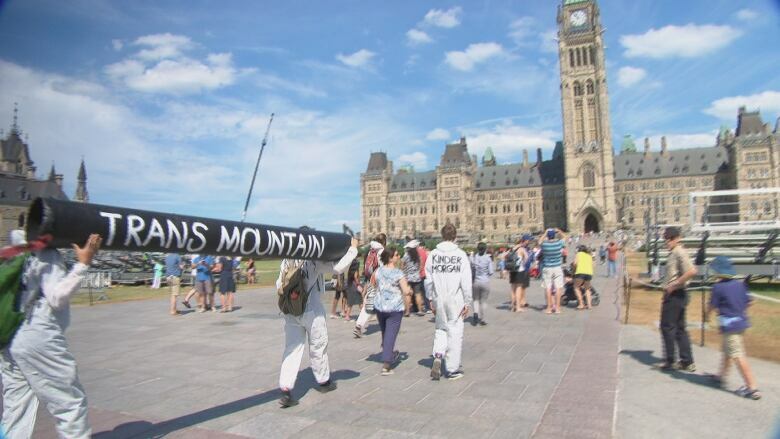 As the deadline for Kinder Morgan to help Canada find another buyer for the Trans Mountain pipeline approaches, protesters gathered on Parliament Hill Saturday to oppose the multibillion-dollar purchase. 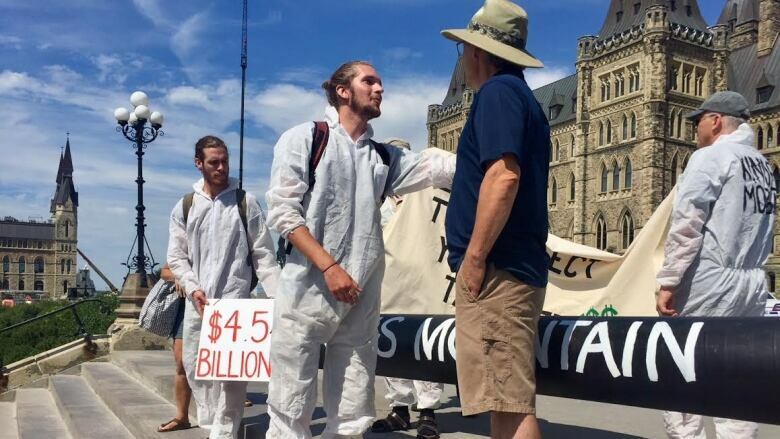 The protesters dressed in white hazmat suits and as Kinder Morgan employees, carrying both a fake pipeline and a bill for $4.5 billion — the cost of the project — to the hill. 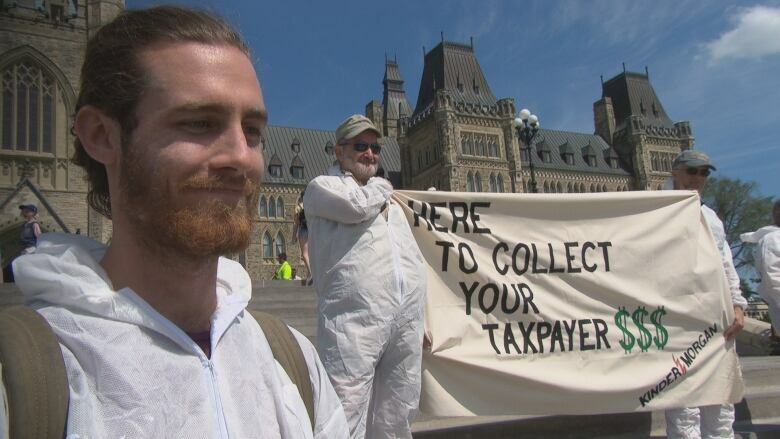 "We think it's absolutely ridiculous that we're spending a whole bunch of taxpayer money on a pipeline," said Gabriel d'Astous, one of about 15 people who took part in the protest. The rally was the latest in a series of demonstrations that have happened across the country against the pipeline purchase. In Montreal, a group of Greenpeace activists were arrested after scaling the Olympic Stadium tower to protest Prime Minister Justin Trudeau's decision. Anti-pipeline protesters at a campsite in Burnaby, B.C., have remained defiant in the face of an eviction order from the city that kicked in Saturday. Kinder Morgan Canada and the federal government have spent the last eight weeks jointly trying to find another buyer, with July 22 serving as the deadline for Kinder Morgan to stop co-marketing the pipeline. Federal officials have said Canada continues to search for new owners and has no interest in being a long-term pipeline owner. If a new buyer isn't found, however, Canada will end up owning the existing pipeline, the Westridge marine terminal in Burnaby, as well as pumping stations and rights of way along the routes. The pipeline project raises concerns about the rights of Indigenous people and climate change, d'Astous said. "We stand in solidarity with First Nations on the west coast who have been fighting this," he said. Aaron Thornell was also at the protest and said he's concerned that spending money on the pipeline won't encourage the country to move toward renewable energy. "I think that this investment sets us down a completely wrong and long path that will not lead to the transition," said Thornell. 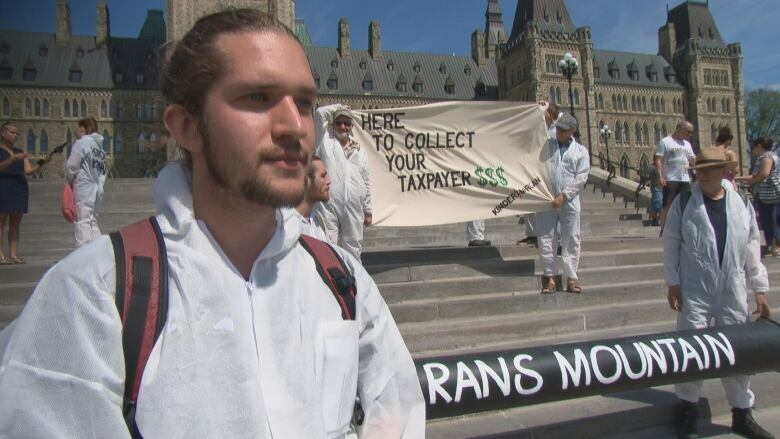 He said he hoped the demonstrations would get people's attention and encourage them to learn more about the Trans Mountain deal. 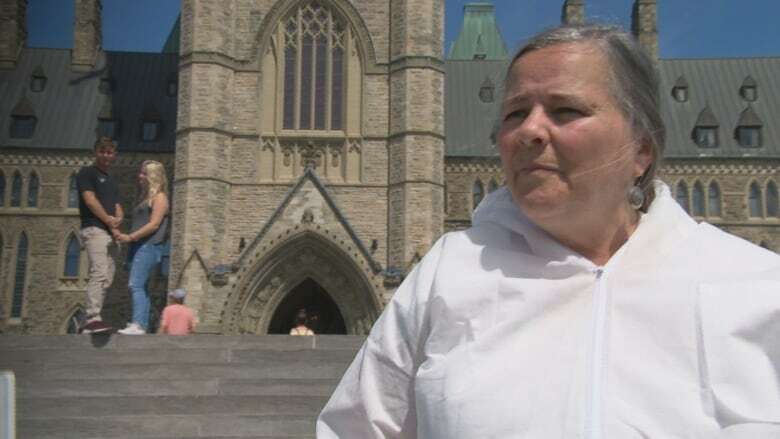 ​Pat Taylor, another protester, said she was disappointed by the Trudeau government. "It's just crazy," Taylor said. "And you know, I have a son. I think about my grandchildren to come and it just breaks my heart." Finance Minister Bill Morneau's press secretary Pierre-Olivier Herbert said in a statement that the transaction process is ongoing, and the government is working with investors to potentially transfer the project and its associated assets to one or more new owners when it's in the best interests of Canadians. 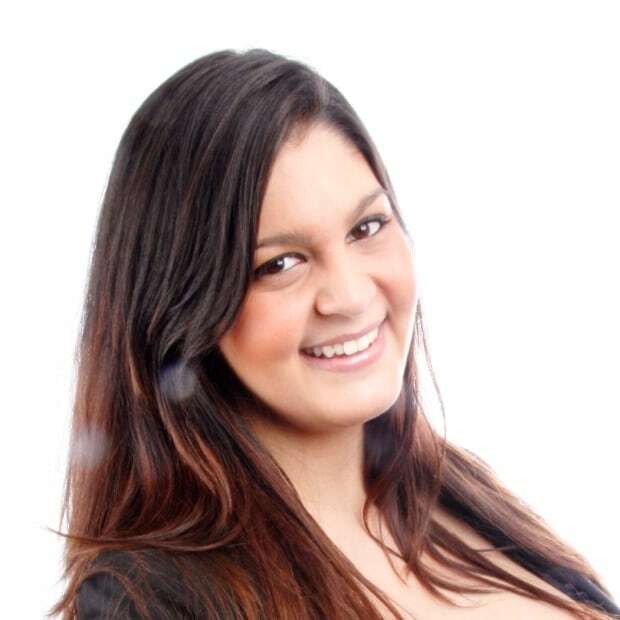 The statement said the project is in the national interest and must be completed. It also said the federal government is defending the interests of Canadian workers, and that by entering into an agreement with Kinder Morgan, it saved the 2018 construction season and protected thousands of jobs.